by Chris Woodford. Last updated: April 29, 2018. Televisions used to be hot, heavy, power-hungry beasts that sat in the corner of your living room. Not any more! Now they're slim enough to hang on the wall and they use a fraction as much energy as they used to. Like laptop computers, most new televisions have flat screens with LCDs (liquid-crystal displays)—the same technology we've been using for years in things like calculators, cellphones, and digital watches. What are they and how do they work? Let's take a closer look! Photo: Small LCDs like this one have been widely used in calculators and digital watches since the 1970s, but they were relatively expensive in those days and produced only black-and-white (actually, dark-blueish and white) images. During the 1980s and 1990s, manufacturers figured out how to make larger color screens at relatively affordable prices. That was when the market for LCD TVs and color laptop computers really took off. How does a television screen make its picture? 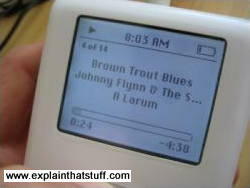 Photo: This iPod screen is another example of LCD technology. Its pixels are colored black and they're either on or off, so the display is black-and-white. In an LCD TV screen, much smaller pixels colored red, blue, or green make a brightly colored moving picture. For many people, the most attractive thing about LCD TVs is not the way they make a picture but their flat, compact screen. Unlike an old-style TV, an LCD screen is flat enough to hang on your wall. That's because it generates its picture in an entirely different way. You probably know that an old-style cathode-ray tube (CRT) television makes a picture using three electron guns. Think of them as three very fast, very precise paintbrushes that dance back and forth, painting a moving image on the back of the screen that you can watch when you sit in front of it. Flatscreen LCD and plasma screens work in a completely different way. If you sit up close to a flatscreen TV, you'll notice that the picture is made from millions of tiny blocks called pixels (picture elements). Each one of these is effectively a separate red, blue, or green light that can be switched on or off very rapidly to make the moving color picture. The pixels are controlled in completely different ways in plasma and LCD screens. In a plasma screen, each pixel is a tiny fluorescent lamp switched on or off electronically. 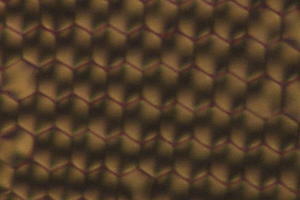 In an LCD television, the pixels are switched on or off electronically using liquid crystals to rotate polarized light. That's not as complex as it sounds! To understand what's going on, first we need to understand what liquid crystals are; then we need to look more closely at light and how it travels. Photo: Liquid crystals dried and viewed through polarized light. You can see they have a much more regular structure than an ordinary liquid. Photo from research by David Weitz courtesy of NASA Marshall Space Flight Center (NASA-MSFC). We're used to the idea that a given substance can be in one of three states: solid, liquid, or gas—we call them states of matter—and up until the late 19th century, scientists thought that was the end of the story. Then, in 1888, an Austrian chemist named Friedrich Reinitzer (1857–1927) discovered liquid crystals, which are another state entirely, somewhere in between liquids and solids. Liquid crystals might have lingered in obscurity but for the fact that they turned out to have some very useful properties. When they're in the nematic phase, liquid crystals are a bit like a liquid: their molecules can move around and shuffle past one another, but they all point in broadly the same direction. 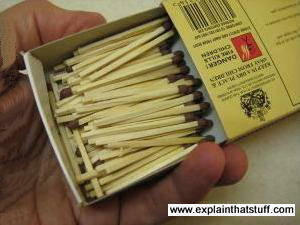 They're a bit like matches in a matchbox: you can shake them and move them about but they all keep pointing the same way. If you cool liquid crystals, they shift over to the smectic phase. Now the molecules form into layers that can slide past one another relatively easily. The molecules in a given layer can move about within it, but they can't and don't move into the other layers (a bit like people working for different companies on particular floors of an office block). There are actually several different smectic "subphases," but we won't go into them in any more detail here. Want to know more about liquid crystals? There's a great page called History and Properties of Liquid Crystals on the Nobel website. Nematic liquid crystals have a really neat party trick. They can adopt a twisted-up structure and, when you apply electricity to them, they straighten out again. That may not sound much of a trick, but it's the key to how LCD displays turn pixels on and off. To understand how liquid crystals can control pixels, we need to know about polarized light. Light is a mysterious thing. Sometimes it behaves like a stream of particles—like a constant barrage of microscopic cannonballs carrying energy we can see, through the air, at extremely high speed. Other times, light behaves more like waves on the sea. Instead of water moving up and down, light is a wave pattern of electrical and magnetic energy vibrating through space. Photo: A trick of the polarized light: rotate one pair of polarizing sunglasses past another and you can block out virtually all the light that normally passes through. Photo: A less well known trick of polarized light: it makes crystals gleam with amazing spectral colors due to a phenomenon called pleochroism. 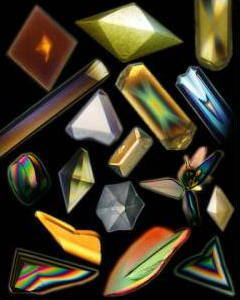 Photo of protein and virus crystals, many of which were grown in space. Credit: Dr. Alex McPherson, University of California, Irvine. Photo courtesy of NASA Marshall Space Flight Center (NASA-MSFC). When sunlight streams down from the sky, the light waves are all mixed up and vibrating in every possible direction. But if we put a filter in the way, with a grid of lines arranged vertically like the openings in prison bars (only much closer together), we can block out all the light waves except the ones vibrating vertically (the only light waves that can get through vertical bars). Since we block off much of the original sunlight, our filter effectively dims the light. This is how polarizing sunglasses work: they cut out all but the sunlight vibrating in one direction or plane. Light filtered in this way is called polarized or plane-polarized light (because it can travel in only one plane). 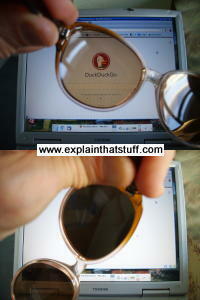 If you have two pairs of polarizing sunglasses (and it won't work with ordinary sunglasses), you can do a clever trick. If you put one pair directly in front of the other, you should still be able to see through. But if you slowly rotate one pair, and keep the other pair in the same place, you will see the light coming through gradually getting darker. When the two pairs of sunglasses are at 90 degrees to each other, you won't be able to see through them at all. The first pair of sunglasses blocks off all the light waves except ones vibrating vertically. The second pair of sunglasses works in exactly the same way as the first pair. If both pairs of glasses are pointing in the same direction, that's fine—light waves vibrating vertically can still get through both. But if we turn the second pair of glasses through 90 degrees, the light waves that made it through the first pair of glasses can no longer make it through the second pair. No light at all can get through two polarizing filters that are at 90 degrees to one another. 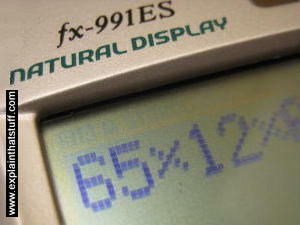 Photo: Prove to yourself that an LCD display uses polarized light. Simply put on a pair of polarizing sunglasses and rotate your head (or the display). You'll see the display at its brightest at one angle and at its darkest at exactly 90 degrees to that angle. Photo: How liquid crystals switch light on and off. 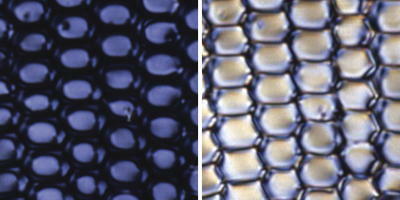 In one orientation, polarized light cannot pass through the crystals so they appear dark (left side photo). In a different orientation, polarized light passes through okay so the crystals appear bright (right side photo). We can make the crystals change orientation—and switch their pixels on and off—simply by applying an electric field. Photo from liquid crystal research by David Weitz courtesy of NASA Marshall Space Flight Center (NASA-MSFC). An LCD TV screen uses the sunglasses trick to switch its colored pixels on or off. At the back of the screen, there's a large bright light that shines out toward the viewer. In front of this, there are the millions of pixels, each one made up of smaller areas called sub-pixels that are colored red, blue, or green. Each pixel has a polarizing glass filter behind it and another one in front of it at 90 degrees. That means the pixel normally looks dark. In between the two polarizing filters there's a tiny twisted, nematic liquid crystal that can be switched on or off (twisted or untwisted) electronically. When it's switched off, it rotates the light passing through it through 90 degrees, effectively allowing light to flow through the two polarizing filters and making the pixel look bright. When it's switched on, it doesn't rotate the light, which is blocked by one of the polarizers, and the pixel looks dark. Each pixel is controlled by a separate transistor (a tiny electronic component) that can switch it on or off many times each second. Light travels from the back of the TV toward the front from a large bright light. A horizontal polarizing filter in front of the light blocks out all light waves except those vibrating horizontally. Only light waves vibrating horizontally can get through. A transistor switches off this pixel by switching on the electricity flowing through its liquid crystals. That makes the crystals straighten out (so they're completely untwisted), and the light travels straight through them unchanged. Light waves emerge from the liquid crystals still vibrating horizontally. A vertical polarizing filter in front of the liquid crystals blocks out all light waves except those vibrating vertically. The horizontally vibrating light that travelled through the liquid crystals cannot get through the vertical filter. No light reaches the screen at this point. In other words, this pixel is dark. The bright light at the back of the screen shines as before. The horizontal polarizing filter in front of the light blocks out all light waves except those vibrating horizontally. A transistor switches on this pixel by switching off the electricity flowing through its liquid crystals. That makes the crystals twist. The twisted crystals rotate light waves by 90° as they travel through. Light waves that entered the liquid crystals vibrating horizontally emerge from them vibrating vertically. The vertical polarizing filter in front of the liquid crystals blocks out all light waves except those vibrating vertically. The vertically vibrating light that emerged from the liquid crystals can now get through the vertical filter. The pixel is lit up. A red, blue, or green filter gives the pixel its color. What's the difference between LCD and plasma? A plasma screen looks similar to an LCD, but works in a completely different way: each pixel is effectively a microscopic fluorescent lamp glowing with plasma. A plasma is a very hot form of gas in which the atoms have blown apart to make negatively charged electrons and positively charged ions (atoms minus their electrons). These move about freely, producing a fuzzy glow of light whenever they collide. Plasma screens can be made much bigger than ordinary cathode-ray tube televisions, but they are also much more expensive. 1888: Friedrich Reinitzer, an Austrian plant scientist, discovers liquid crystals while studying a chemical called cholesteryl benzoate. It seems to have two distinct crystal forms, one solid and one liquid, each with its own melting point. 1889: Building on Reinitzer's work, German chemist and physicist Otto Lehmann coins the term "liquid crystals" (originally, "flowing crystals" or "fliessende Krystalle" in German) and carries out more detailed research using polarized light. Although his work is nominated for a Nobel Prize, he never actually wins one. 1962: RCA's Richard Williams begins to research the optical properties of nematic liquid crystals. He files his groundbreaking LCD patent (US Patent 3,322,485) on November 9, 1962 and it's finally granted almost five years later on May 30, 1967. 1960s: RCA engineers like George Heilmeier build on this theoretical research to produce the very first practical electronic displays, hoping to create LCD televisions. 1968: RCA publicly unveils LCD technology at a press conference, prompting The New York Times to anticipate products like "A thin television screen that can be hung on the living-room wall like a painting." 1968: French scientist Pierre-Gilles de Gennes carries out groundbreaking research into phase transitions involving liquid crystals, for which he wins the Nobel Prize in Physics in 1991. 1969: RCA's Wolfgang Helfrich develops twisted nematic LCDs based on polarized light, but the company is skeptical and shies away from developing them. At Kent State University, James Fergason develops and patents an alternative version of the same idea. Today, Helfrich, his collaborator Martin Schadt, and Fergason are jointly credited with inventing the modern LCD. 1970: Having failed to commercialize the LCD, RCA sells its technology to Timex, which popularizes LCDs in the first digital wristwatches. 1973: Sharp unveils the world's first LCD pocket calculator (the EL-805). 1980: STN (super twisted nematic) displays appear, with far more pixels offering higher resolution images. 1988: 100 years after the discovery of liquid crystals, Sharp sounds the death knell for cathode-ray tubes when it produces the first 14-inch color TV with a TFT (thin-film transistor) LCD display. Liquid Gold: The Story of Liquid Crystal Displays and the Creation of an Industry by Joseph A. Castellano. World Scientific, 2005. A scholarly, chronological account of LCD development that takes us from the early RCA days to the PC revolution and HDTV. Crystals that Flow: Classic Papers from the History of Liquid Crystals by Timothy J. Sluckin, David A. Dunmur, Horst Stegemeyer. Taylor & Francis, 2004. A collection of important papers in liquid crystal research from 1888 to the 1970s, with a short commentary on each. Liquid Crystals: Introduction to Liquid Crystals: Chemistry and Physics by Peter J. Collings and Michael Hird. CRC Press, 1997/2017. An interdisciplinary book exploring the history, science, and technology of liquid crystals and LCDs. Liquid Crystals by Sivaramakrishna Chandrasekhar. Cambridge University Press, 1992. A classic textbook about the three types of liquid crystals, their properties, and their various applications. Nanoscale Pillars and Holes Could Lead to Brighter Displays, Less Glare by Dexter Johnson. IEEE Spectrum, November 24, 2014. A new polarizing filter that absorbs less light could make LCDs brighter and reduce power consumption. How RCA Lost the LCD by Benjamin Gross. IEEE Spectrum, November 2012. Although RCA owned the original patents for LCDs, it failed to turn them into a winning commercial technology. LCDs' Bright Future by Alfred Poor. IEEE Spectrum, September 29, 2011. A look at the latest trends in LCD design. LCD pocket color TVs by Herbert Shuldiner, Popular Science, September 1984. This is how Popular Science announced the arrival of compact LCD screens over a quarter of a century ago. Includes quite a nice 3D diagram of how liquid crystals twist polarized light. [PDF] Fundamentals of Liquid Crystals: How They Work and What They Do by Fujitsu. This useful backgrounder picks up from where my article leaves off, explaining the detailed workings of LCD displays, and the various different types, simply and clearly. US Patent 3,322,485: Electro-optical elements utilizing an organic nematic compound by Richard Williams, RCA Corporation, May 30, 1967. RCA's original patent on nematic LCDs. US Patent 3,731,986: Display devices utilizing liquid crystal light modulation by James L. Fergason, RCA Corporation, May 8, 1973. An early display using twisted nematic LCDs.